Greenworks is a newer name in the home improvement sector that focuses on eco-friendly options. They range from lawn mowers, leaf blowers, and snow blowers. Their products are either powered by an electrical cord or their own batteries. A quieter and environmentally friendly alternative to gas snow blowers. The Greenworks line consists of two snow throwers that primarily differentiate themselves in how they are powered. One uses an electrical cord while the other uses their line of batteries. These batteries can be used in other Greenworks tools as well. This thrower has become popular on Amazon primarily due to its incredibly low price. The 20-inch width and 10-inch clearing depth is not bad. At just under 32 pounds, it’s perhaps the lightest device on the market. Being electric, its quiet, doesn’t vibrate much, and requires next to no maintenance. This Greenworks Snow Blower can use up to 13 amps to power itself. This limits how far it can throw snow which is about 5 feet. It surprisingly can handle around 6 inches of the powdery stuff. Although anything over 4 inches will require another pass to clear it down to the surface. The wetter the snow, the worse this will perform. And clearing the big pile at the end of the driveway will require breaking up some snow with a shovel first. The auger is made of thick plastic with a polyurethane coating. This works fine with light snow but it just can’t break up heavier snow or ice chunks. It also doesn’t spin that fast so you’ll need to take it slow with anything over 3 inches. The plastic should make it safe for wood decks and grass surfaces. Chute controls are really easy. A rod underneath the handlebars gives you 180 degree control for on the fly changes. You can use one hand on that and the other pushing the blower. The plastic chute can back up, especially over time when the engine gets hot and starts melting the built up snow (creating more of a slush inside). You’ll want to make sure you regularly coat it in a non-stick cooking spray or car wax to alleviate this issue. Controlling the Greenworks Corded Snow Thrower is easy if you can avoid the cord. At 32 pounds, even a child should be able to push and make tight turns. 7-inch wheels are sufficient although don’t provide a lot of traction. Might make it tricky on steep slopes when it’s icy out. A push button start is used to turn on the blower. Folding handlebars allow for a small footprint wherever you choose to store it. Greenworks offers a model with and without LED lights. The one with lights has two headlights underneath the handlebar and is more expensive. You’ll want to make sure you buy an extension cord that is rated to at least 13 amps. 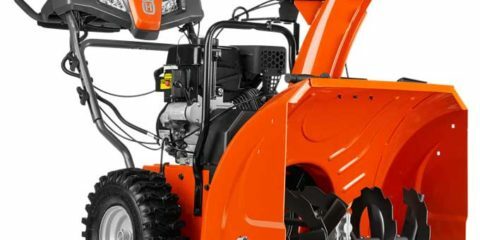 A common mistake with electric snow blowers is buying a lower quality cord and not getting the maximum power the machine can produce. Even worse are sites like Amazon and Lowes will suggest these lower rated cords to unsuspecting buyers. This is a nice product if you go in with the proper expectations. If you aren’t dealing with regular blizzards and just need some help clearing a single-car driveway or sidewalk, this will do the trick. Being made mostly of plastic will shorten the life of it. But if you get 4-5 good years at this price, isn’t it worth it? This model is almost identical to the corded version. Instead it works off either a 40V or 80V Greenworks battery. It can be purchased with or without the headlights. I haven’t tested the battery model, but you’re likely to get a similar experience. The only issue is that with a battery, the power isn’t constant. When it gets near the end, power will wain which can be frustrating. Although you don’t have to deal with an extension cord. The problem with the Greenworks cordless snow thrower is price. The corded one is a great deal at just over $100 (even less on sale). But the cordless versions can be over $300 when you include a battery and charging station. Buying the cordless version makes sense if you already own other Greenworks products. That means you don’t have to buy new batteries which are a considerable expense. Or if you’re committed to using an eco-friendly option. Otherwise at that price, you’re better off getting something like the Toro Power Clear 518 ZE. Costs slightly more but is much more powerful and built to last.